Next month, the Intrepid Museum will be saying good-bye to the temporary exhibition Ports of Call, which has charmed staff and visitors alike. The prospect of international travel was—and is—a major enticement for would-be sailors. During Intrepid’s Navy career from 1943 until 1974, the ship visited more than 30 countries. After each deployment, crew members returned home with slides, souvenirs and stories. Decades later, many of these men donated their port-of-call memorabilia to the Intrepid Museum. 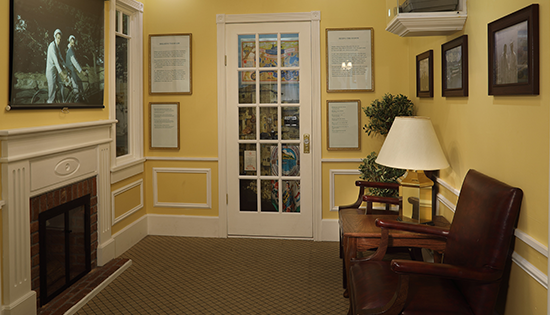 These rich collections inspired us to create the Ports of Call exhibition. The exhibition design works hand-in-hand with the artifacts to immerse visitors in the past. 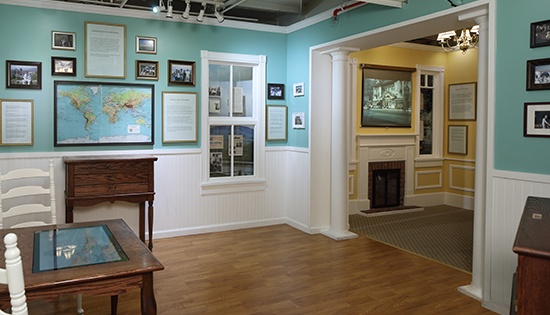 The gallery recreates a typical 1960s living room decorated with souvenirs that Intrepid sailors collected while on liberty in foreign ports. One of our favorite things about this exhibition has been watching visitors, especially children, interact with the space. Visitors can watch a slide show shown on a vintage slide projector and use a rotary telephone to hear veterans recount their travel adventures. We’ve enjoyed watching kids puzzle over these unfamiliar technologies and listening to adults explain these relics to their younger companions. Ports of Call will be open through Sunday, February 24. To see more sailor souvenirs from the Museum’s collections, check out our online exhibition On Liberty, At War: Intrepid’s Ports of Call during the Vietnam War, available on the Museum’s Google Arts & Culture page.